I love hand held foods. What could be better than holding something in your hand and eating it? It’s the ultimate in minimalism. No utensils, no cutting – just grab and eat. I have a long list of favourite handhelds, but I’d have to say that my absolute favourite is Vietnamese spring rolls. Spring rolls are the one thing I can never refuse, no matter how full I am. If you’re hungry and you feel like going to a Vietnamese restaurant and ordering a plate of rolls to munch on, you might get a little confused. On menus, I’ve seen Vietnamese spring rolls go by multiple monikers: imperial rolls, crispy rolls, or egg rolls. 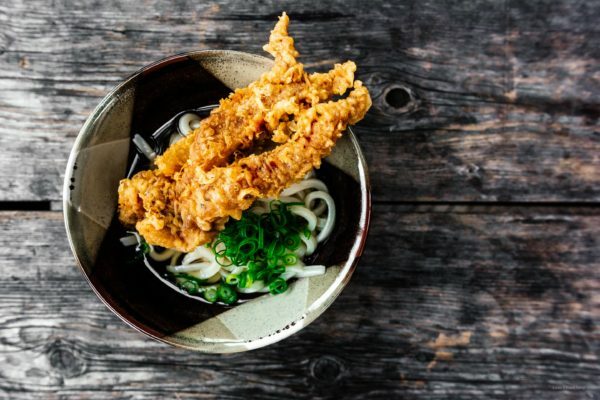 It isn’t so bad because they’re all really the same thing: meat rolled into a rice paper or wheat flour wrapper and deep-fried to golden brown deliciousness. What’s funny is that the rolls don’t even go by just one name in Vietnamese. The name I’ve seen and heard the most is chả giò, which loosely translates to rolled meat, but they also go by chả ram, which specifically refers to pork and shrimp spring rolls. Their third name (and probably least common from what I’ve seen) is nem ran – meaning deep fried meat – which is what the Northern Vietnamese call their spring rolls. Whatever they’re called, they are crispy and incredibly addictive. In restaurants, spring rolls are usually eaten as an appetizer or side dish. I have it on good authority that most Vietnamese people don’t eat spring rolls all that often at home. When they do though, it’s done differently from how you see them served in a Vietnamese restaurant. 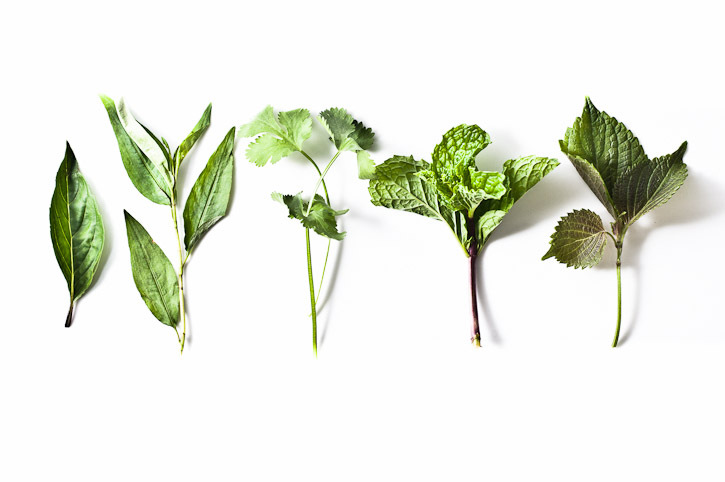 From left to right: Thai basil, rau răm (Vietnamese mint), cilantro, mint leaves, shiso. 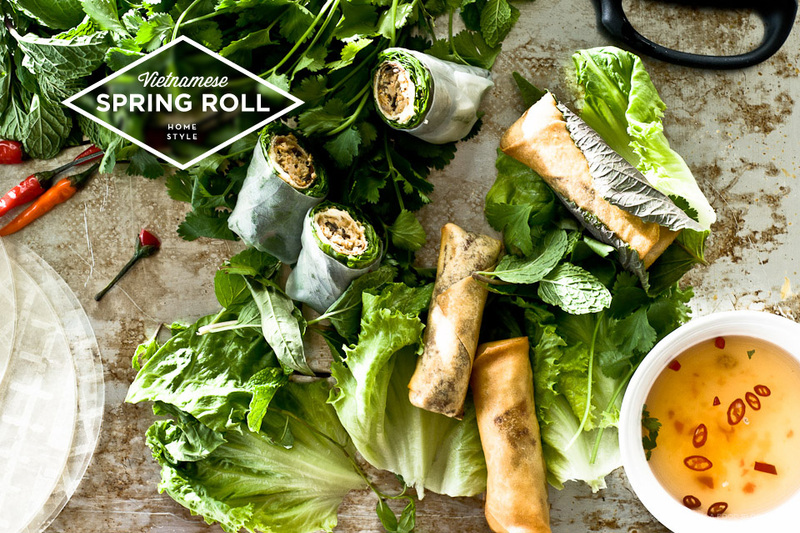 Unlike at a restaurant, where you’ll get two long rolls, cut into fours and placed on top a piece of lettuce, eating spring rolls the real Vietnamese way requires lots and lots of lettuce and an arsenal of fresh herbs. Whole rolls are wrapped up in a leaf of lettuce and lots of fresh herbs are added to create a kind of lettuce spring roll wrap. It makes for super fresh tasting spring rolls. The contrast between the hot roll and the cool, crisp lettuce is incredible. I first had spring rolls like this one of the first times I had dinner at my in-laws’. They weren’t my in-laws at the time, and I was on my best behaviour. Before going over I had vowed to myself that I would not pull a typical Steph-like move and make a fool of myself (I’m an extreme klutz). Thankfully, I didn’t knock over a plate of food or walk into the kitchen table, but somehow I did end up both screaming and crying anyway. The dinner started out innocently enough. It was a gorgeous summer evening. The sun was slowly setting and the heat of the day could still be felt without it being oppressively hot. It was such a nice night that Mike’s parents decided we’d eat outside, on the deck. The table outside was beautifully set up with giant bowls of fresh, leafy greens and herbs. There was a tub of fish sauce (literally, a tub with a ladle for serving ease!) and plates and plates of rice paper. I was super excited to be eating authentic Vietnamese food. And what’s more, Mike had told me before hand that his mom would be making spring rolls, my favourite! My future mother-in-law was deep-frying when we arrived and I was eager to help. No mishaps here: I’m not scared of hot oil or deep-frying and it was fun chatting with her about the spring roll ingredients. We stopped frying after about 20 rolls, which I thought was plenty. I was in for a surprise though, because as soon as I was done plating up the rolls we just fried, Mike’s mom opened the oven door to reveal over a hundred more spring rolls just happily keeping warm. My mouth literally fell to the floor and I started looking around to see if other people were going to be joining the spring roll party. But no, it was just the four of us. I’d thought I had a problem with over making food, but Mike’s mom seriously outdid me. Me: She doesn’t expect us to eat all that does she? Mike: No, seriously, I told her you like spring rolls so she got really excited. All was going well until I saw a wasp hovering over the ruby-red container of fish sauce. I have an extreme wasp/bee phobia. I will run and scream if they come near me. I’ve survived my whole life without being stung and I am deathly afraid of one day losing my perfect no-sting record. I’m convinced I’ll go into anaphylactic shock and die. At the merest hint of a buzzing black and yellow insect, I’ll run away from conversations held outdoors, patios, and out of (almost) moving cars. When I was a kid I once locked myself out of my room for over 8 hours when a giant, angry hornet somehow made it past my window screen. My phobia is unfounded and severe, but I just can’t help myself. Their little black and yellow bodies are just so scary! I tried to ignore the lone wasp buzzing over the fish sauce. I didn’t want to make a scene. I kind of “eeped” a bit and froze, but managed not to scream. Thankfully the wasp flew off after a bit. We were just starting to dig in when I heard a wasp buzz past my ear. It was the sound of my nightmares. Mr. Wasp decided the fish sauce was good stuff and he brought back his little waspy friends. I couldn’t help myself. I screamed like a 4 year old and grabbed on to Mike. I desperately wanted to run away but I was torn, I wanted to at least attempt to maintain some semblance of being a functioning adult. Thank goodness Mike’s parents were understanding. They totally got that I was terrified and suggested we move inside. Mike’s mom even admitted to me that she too wasn’t fond of wasps. It made me feel so much better. Of course later Mike told me that his mom actually kills wasps with her bare hands. With the screaming episode over, we finally got to the food. Mike’s family eats spring rolls with lettuce (the way I mentioned before), but they also one-up the lettuce by wrapping up their spring rolls, lettuce and herbs into a salad roll. That’s right: double roll! Imagine the heavenly crispiness of a deep-fried spring roll wrapped up in the freshness of a salad roll. Seriously food coma inducing stuff. I’d like to say that it was so good I cried, but no, I didn’t cry from joy. It was the fish sauce. As we were ladling out the fish sauce-bright-red from all the chilis in it-Mike’s mom mentioned that she toned the chilis down a bit because she wasn’t sure how much spice I liked. I said it would be fine and happily dipped away. And it was fine – for a while. The fish sauce was delicious: tangy, sweet, and spicy. Oh so spicy. Tongue-numbingly, tears rolling down your face spicy. I felt like I was on fire, but after the screaming, I didn’t want everyone to see me crying too. I thought to escape to the washroom for a bit and cool off the fire on my tongue, but no such luck. Mike’s mom is very observant. She didn’t say anything though, she just kindly handed me a box of tissues and got out the special jar fish sauce she keeps in the fridge for little kids. I felt so embarrassed. Screaming and crying. So much for a good first impression. I’m sure Mike’s parents must’ve thought I was such a baby. It was worth it though, I’d do it all again just to eat my mother-in-law’s spring rolls! My mother-in-law has the best spring roll recipe ever. It goes something like this: Blend a bunch of pork and shrimp together in a processor. Add a little shredded carrots, shredded taro, onions, shallots and garlic. Then some sugar, fish sauce and pepper. Roll. Fry. That’s it. Basically, it’s the typical a little bit of this, a little bit of that kind of recipe. Old school Asian cooks aren’t too big on measurements. I figured it out after a bunch of trial and error and now my rolls are almost as good as hers. 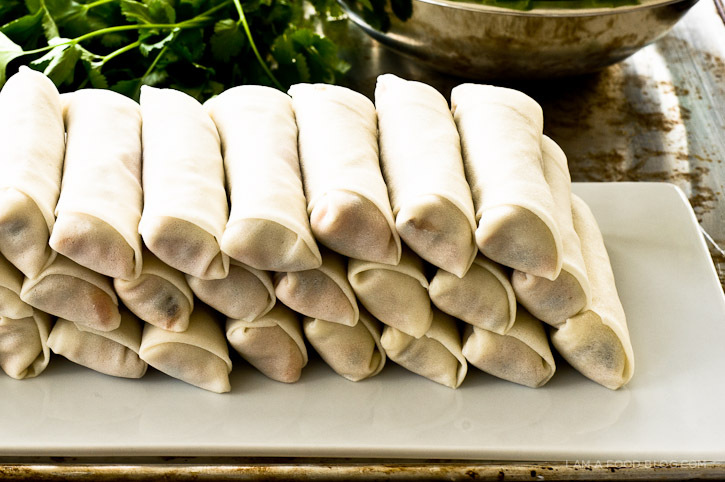 Vietnamese spring rolls come in two types of wrappers: the typical Chinese wheat spring roll wrapper or rice paper wrappers. Traditionally Vietnamese spring rolls are made with rice paper, which is a combination of extra crispy with a bit of chew. They’re a bit heartier and not as delicate as wheat roll wrappers. I always use wheat spring roll wrappers because I love the flaky, golden crunch. This recipe makes a lot of spring rolls, but don’t worry, they freeze well and deep-fry great from frozen. Besides, if you’re gonna roll spring rolls, you might as well do it assembly-line style. Yes, they take a bit of work, but you won’t regret making these rolls: they’re addictive golden-brown, crispy deliciousness. They’re so good that I find myself “testing” so many random rolls while frying that I end up with about half a batch gone by the time I’m done. i am crunchy, i am rolled: i am vietnamese spring roll! In a food processor, blend the shrimp until it comes together into a paste. Add the pork and blend until the pork and shrimp are thoroughly combined. Put the pork-shrimp mixture in a bowl and add the mushrooms, carrots, taro, onion, garlic, shallot and the seasonings. Mix thoroughly. Test the seasoning by frying a tiny patty of meat in a frying pan. Adjust the season accordingly. Take a wrapper and place it in front of you like a diamond. Make sure the other wrappers are covered with a damp paper towel so they don’t dry out. Spread out 1 tablespoon of filling not quite in the middle of the wrapper. Fold the corner closest to you up and towards the corner farthest away from you. Pinch to make sure the wrapper is tight around the filling. Fold in the two sides to where it meets the filling. Try to keep the sides straight. Pinch and roll tightly. Lightly dampened the last corner with a bit of egg before rolling up all the way. Roll all your rolls before you start frying. Line a baking sheet, or plate with parchment or wax paper to place your spring rolls on. 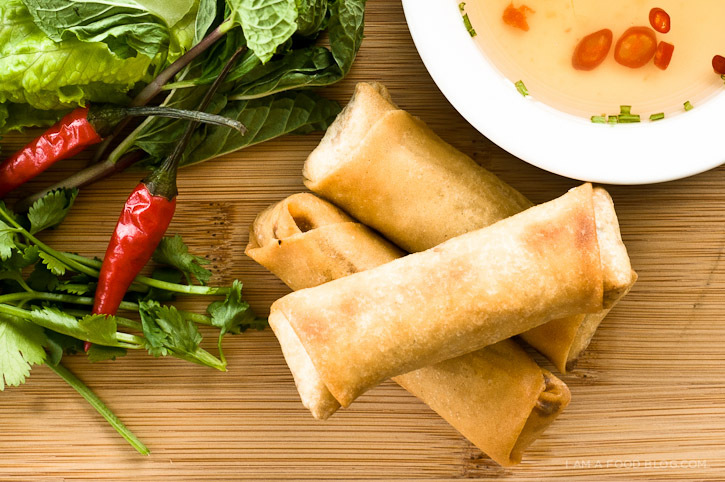 Make sure you have a damp paper towel to cover your completed spring rolls and the spring roll wrappers. If you don’t cover them with a damp paper towel, the skin will dry out. If you want to stack your spring rolls, be sure to have a piece of paper in between the layers as well. 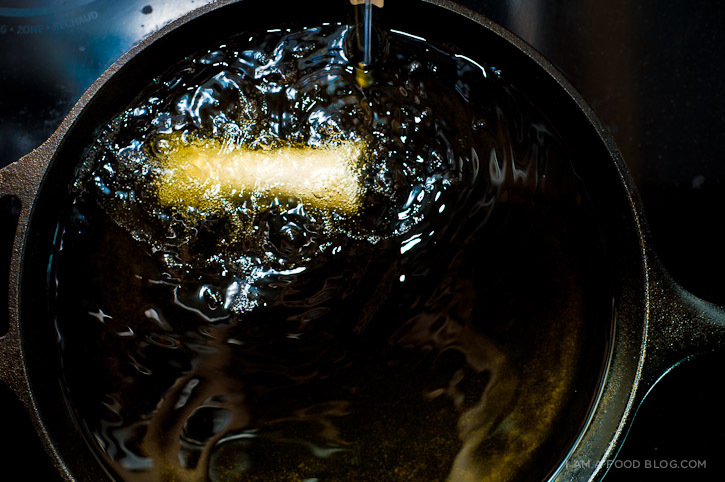 Fill a deep sided pot (I like to deep fry in my cast iron pan) with several inches of oil (enough for the spring rolls to float). 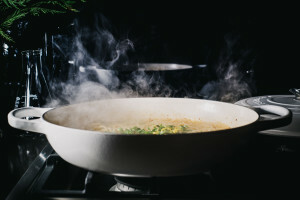 Heat the oil over medium to medium-high heat until it reaches 350°F. Gently add your spring rolls, being careful not to overcrowd. It’s best to deep-fry in batches. The rolls should bubble immediately when they hit the hot oil. If they don’t, your oil isn’t hot enough. Fry until the skins turn golden brown and crisp, about 6-8 minutes. Remove the rolls and drain on paper towels. These rolls stay hot for quite some time so be careful when you bite into one! **If you want to try these rolls Spring-Roll Salad Roll style, grab some green leaf lettuce, a bunch of herbs (Thai basil, cilantro, Vietnamese mint, regular mint, shiso), and a pack of rice paper wrappers. Have a medium-sized bowl of hot tap water ready for softening the rice paper. Quickly dip the rice paper into the hot water, making sure the entire piece is wet. Lay the wrapper on your plate (it will continue to soften as you are assembling your roll). Lay down a piece of lettuce, add some herbs and then place a lovely golden spring roll in the middle. Wrap it up as you would a spring roll, dip into fish sauce and have your mind blown by the difference in textures and tastes. PS – I’m trying out a new longer format. Let me know what you think! Your recipes and photos are always wonderful, but I’m a sucker for a good story. I’ll be trying these. And as I do, I’ll be thinking of your mother-in-law, fish sauce, and wasps. I also enjoy the longer format. And that first photo with all the greens is so beautiful! What a story you’ve shared here. I hope to try these soon. Great pics, great recipe, great new format. I love Vietnamese food, particularly spring rolls and summer rolls – if you ever come to London we are big fans of Com Viet on Garrick Street, Covent Garden and Cay Tre on Dean Street in Soho. 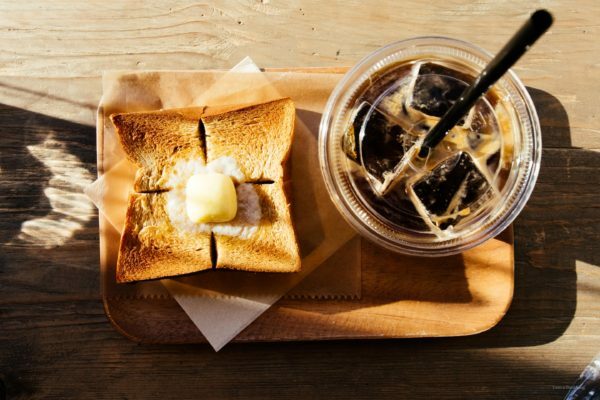 This caught my eye through foodgawker. I’m just recently getting into the Vietnamese food. I made my first pho and I made some spring rolls, but not the fried kind, the rice paper type with lots of veggies inside. I told my family it was Vietnamese soup and salad (in a roll night). I’m pinning your recipe to try next time. I think your talking about Vietnamese summer rolls/Gỏi cuốn. FYI. Both nom nom. We get our spring rolls in Hawaii with the full accompaniments like yours but also julienne carrots and daikon for crunch nice pics and story. I’m so confused about different wrappers! One brand I bought was soft and doughy (grocery store brand), another brand was thinner but tougher, drier (name brand). Are there different applications for each? Or is one more authentic than another? I believe they both said egg roll wrappers. Did they have any that were labelled “Spring Roll Wrappers”? Generally the wrappers I use are not at all doughy. They’re super-thin and dry. Great post! The wasp story is great and I love all of your pictures. Looking forward to making these and like potstickers, I love to make a bunch and freeze them for another time, can’t wait! I came upon your blog after reading (and making) your Soy Sauce Eggs on MomoFukuFor2 and I have to say I just adore you! I loved reading this story and I can’t wait to read the rest of your recipes. It is so much more meaningful to read a recipe with a lovely story behind it. I’m starving. I found your blog by googling “seaweed salad” because I desperately needed to make this at home and it was one of the happiest discoveries of my LIFE. Your photography, styling, editing and graphics/typography are INSANE. OMG you are too cute! Great back story. Ok, I just spent 45 minutes on your website. I am officially addicted. Thank you for the glorious recipes and beautiful photos. Never stop posting! xoxo! How many thousand spring-rolls will I need to roll (or fold) till I manage to make so beautiful spring-rolls like the ones in the pictures? This looks like perfection! this blog is so gorgeous, my brain just exploded in my skull. got here by googling “momofuku milk bar cookbook”, and i’m ever so glad i did. bless you. If you are not frying your spring rolls can you make ahead and freeze them? I am making a shrimp filling. Thanks for any input. Spring rolls are perfect for freezing. Lay the springs rolls on a piece of parchment or wax paper. If you’re stacking them, make sure to put a piece of paper in between as well. Then just go ahead and freeze them. Once frozen, you can gather them up and transfer them to a plastic freezer bag. When you want to fry them, just fry them from frozen, without defrosting. your photos are so enticing! 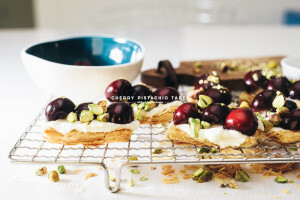 hi, i love this receipe and beautiful photos! i’d also really like to subscribe by email, is that possible? Good recipe. I did almost everything except the taro root. Also I am next time going to use less fish sauce and take out the sugar all together. Instead of using rice wrappers (for dietary purposes) I used seaweed wrappers. (salad version) It was interesting, I dont think I will do it again. But tommorow morning I think I will use the wrappers and taste it again. Is there anyway to lighten up the fish sauce dipping sauce? It was way too strong for me, but the chili peppers are really good in the spring roll. 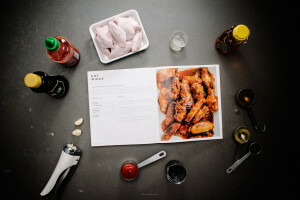 I didn’t notice anything more than a casual mention of the fish sauce based dipping sauce in the original post, except in the story at the top, but I’m assuming you’re talking about nuoc cham, the amazing, beautiful, wonderful lime, sugar, water, fish sauce, chili concoction so prevalent on the Vietnamese table. If so, play with it. Change the ratio of lime juice, fish sauce, water, sugar, etc until you have a version that tastes good to you. 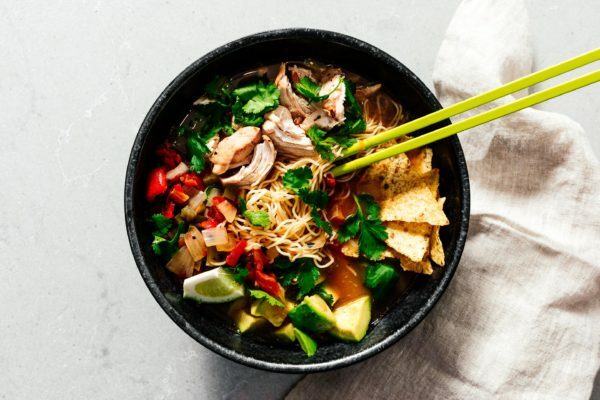 A little bit of white or rice vinegar can lighten it up as well, though I prefer mine with roughly equal portions lime, water, and fish sauce. 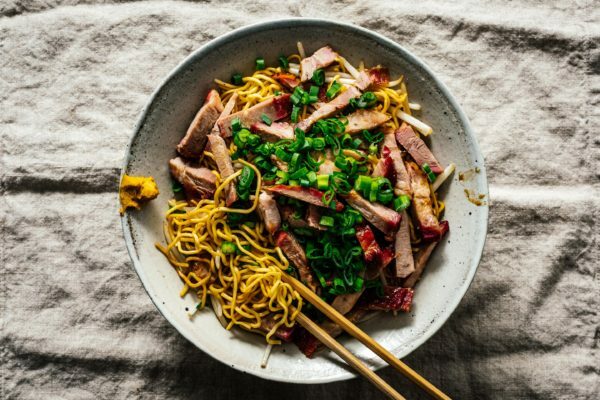 Andrea Nguyen’s website has the best basic nuoc cham “recipe” I’ve found so far. Also, make sure you’re buying high quality fish sauce, the cheaper stuff can be somewhat (to VERY) obnoxious. Fried is WAY better! I fried the spring rolls and then put tons of lettuce, Thai basil, mint, and chili peppers on them delicious!!!!! I still skip the fish sauce since it was too intense and real salty. But I think if I can make the fish sauce dip that I get from the Vietnamese restaurant this will be perfect. Only problem I ran into is frying, apparently it matters on what type of rice paper you have. I think I had the clear ones that are meant to be soaked then roll. They didn’t fry like the picture. I still had a crunch but not that beautiful golden brown at all!!!! I shall be trying this recipe again and again, until I perfect it! Thank you!!! Wow this sounds so delicious!! I love spring rolls so I’m going to have to try making these myself!!! Thanks for a great blog!! Staying true to my word I have attempted to make these again, I change the type of spring roll wrappers and came out soooooooo much better!!!! Also this time in the mix I put daikon in it (just trying to use up stuff). The last time I put peas in it all taste delicious. This time I added more seasoning, so 2 Tbsp of fish sauce, eyeball about 1-2 Tbsp of sugar. More about 2 tsp of kosher salt. But in my defense I had about a pound in a half to 2 pounds of ground pork. Also I put 6 cloves of garlic. I did a lot of eyeballing this time around! I am going to try a peanut dipping sauce with them the next time. Thanks again for sharing your recipe!!! This is now becoming one of my favorite things to eat! Also LOVE that they are freezeable, I have two containers full of premade spring rolls!!! Mmmmm! I make “spring rolls” that aren’t fried…their the softened rice paper wrapped around a salad-like filling, with just a bit of meat (mostly rice threads or bean threads)… It’s what the Hmong in my area call “Spring Rolls.” Conversely, they call the fried rolls “Egg rolls.” I’m going to have to search out the rice papers you speak of…they’re different from the rice (banh trang) papers I currently use. I think locals are using mandarin pancakes for egg rolls… Aren’t the sauces a kick? It all depends on the spice you can take! MY GOSH. I’m overly excited to have found you! 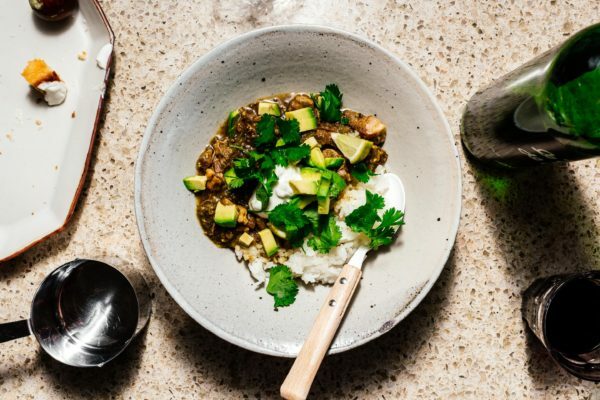 Every SINGLE recipe you have looks amazing. That’s a total understatement. I’m a huge fan! Thanks so much for sharing all of this. Your recipes are so clear and easy to follow. Thanks so much for sharing. I’m Chinese-Filipino, so we call ours “lumpia” :) Anything deep fried is heaven to me….yummy!!! I love your styling as well! 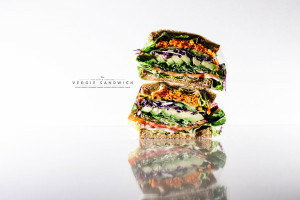 They look amazing and I’m also a fan of the massive images on this blog! The food all looks fantastic particularly when I’ve still to have lunch. I LOVE your pictures! I am having a party for around 100 people in about 3 weeks and was thinking about freezing them. I was wondering if the rolls keep better fresh frozen or fried until lightly browned then warmed up in the oven when ready to serve. Great article with fantastic photography. Looks mouthwatering! Really nice and and wounder full recipes are that you mentioned here in this Blog Really Appreciated. Omg, gorgeous. So glad you’re blogging again. my view suggest to my friends. I am sure they will be benefited from this website. Is there a good summer roll recipe on I am a food blog.com? I would like to see one that is not deep-fried. I really like to have our later food. I love to have spring roll in my starter. I never deep fried the roll, I usually use to fry on pen. But this seems more perfect. 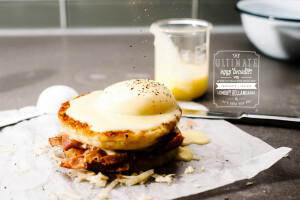 I cannot wait but to follow this yummy recipe! 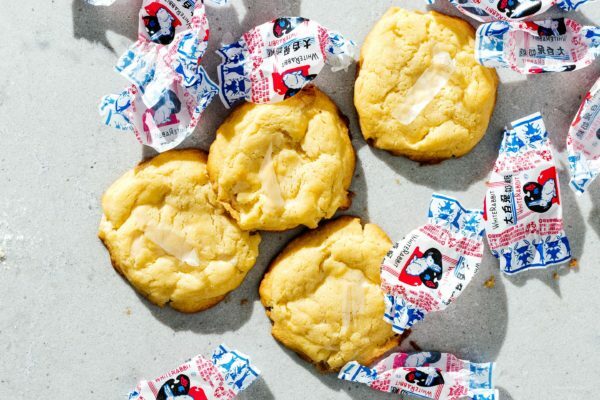 My Aunt used to make these for the family long ago, and we ate them in the exact same way. A table full of rolls with even more greens surrounding it is an amazing sight. Thank you for posting this recipe up. 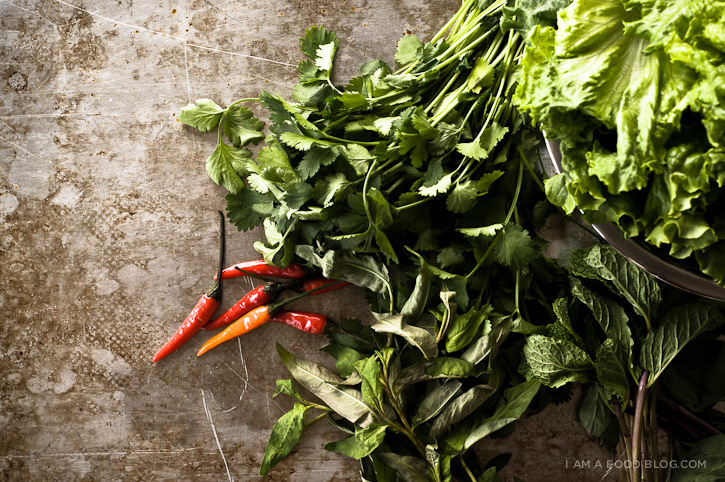 Did your mother in law happen to give you her recipe for her fish sauce? What kind of peppers does she use? All I know about my aunt’s dipping sauce is that my cousin would call it rocket fuel. This Blog is very nice i like it. This story is absolutely brilliant!! And the recipe looks great as does the whole blog, great work! Love spring rolls. Need to try this. These look amazing! Beautiful Blog! Love it all! Fellow food photographer and blogger. 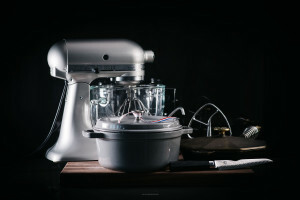 I love your blog, but i wish you have a version for step by step while you cooked ! so that could be easily for the beginner to try when got photo ! thank you ! As fantastic to eat as look at, my 14 year old daughter got really good at the package making. We made a well-balanced nuoc cham dipping sauce to go with them and then I watched them disappear…… FAST. Thanks for the great recipe. Love your blog which I just discovered and have already done these and the terrific Guinness and beef pies, I did individual pies in mini forms. The meat was amazing! 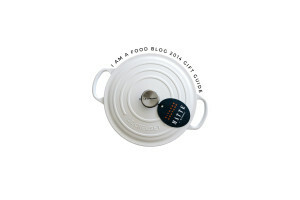 Our new year will only be your recipes, thanks for following your heart and talent. Happy New Year! I’m originally from Orange County, California, and I used to frequent this wonderful Vietnamese take out restaurant in Little Saigon that sold these Spring Rolls 3/$1 and I would buy $15/$20 worth at a time, they were that good! I’m now living in Southern Illinois so making these myself is my only option and I’ve had to purchase many of the items (rice noodles, fish sauce, woodear mushrooms)and my first attempt came out OK, but the skins I used were Three Ladies Rice wrappers (yes, I bought off Amazon). The only ones I can purchase locally are Nasoya brand. Has anyone used these and had them come out OK? Anyway, ADORE this story and the spring rolls as well! I want to try making a vegetarian version (maybe tempeh instead of the ground beef) and gettin’ my spring roll on!! Can the spring rolls sit in the fridge for a few hours or overnight before frying? If you need to hold them it’s best to just freeze them and then fry from frozen. I absolutely love your blog. I can’t wait to try these beautiful rolls! Growing up, we had spring rolls in our freezer a lot, usually the wheat pastry ones (our family is Viet Chinese). I learnt to roll these from a young age; at one family party I must have rolled almost a thousand at a the age of 12 or so. The trick my mother has for freezing these is to partially deep fry them before freezing. This actually prevents them from turning very dark which happens when they are cooked from raw frozen, so when you take these ones out and fry them a second time for eating, they are a lovely golden brown. do you cook the shrimp and pork before hand? or in food processor raw? hi jennifer, it goes into the food processor and the wrappers raw and is cooked when you deep fry. What fish sauce do you recommend? Made these last night. They were DELICIOUS!!! Loved by all. Putting this one in my recipe binder!! hi aya! you can use ground chicken or ground turkey! 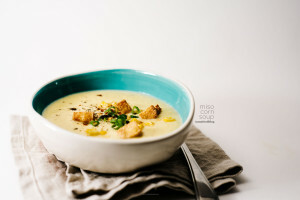 I realise this post was from some years ago but I’ve made your recipe and absolutely loved it! After being laid off recently I have become a stay at home dad, butler and chief cook of the household. One of my biggest thrills is having the time and energy to make dishes for my family we all love. Your crispy spring roll recipe was, is and will always be a hit in my house! We can’t afford to eat out as often as we use to so having the ability to treat ourselves to our favorite Vietnamese (or as my daughter calls it, “Bee-it-my-knees”) is really a pleasure. I’ve made these several times, always according to the recipe as it is written. They are so good. My mouth waters thinking about them. They freeze well. I like dipping them in Nuoc Mam (?) sauce. I don’t understand how anyone could not like fish sauce. It is to Vietnamese food what salt is to Western food. It doesn’t take over a dish if used correctly. It enhances with a subtle and non-fishy flavour. Thank you so much for this recipe. Tried your recipe as written. I’m keeping this one and plan to make it again for a bigger crowd. Thank you for sharing! 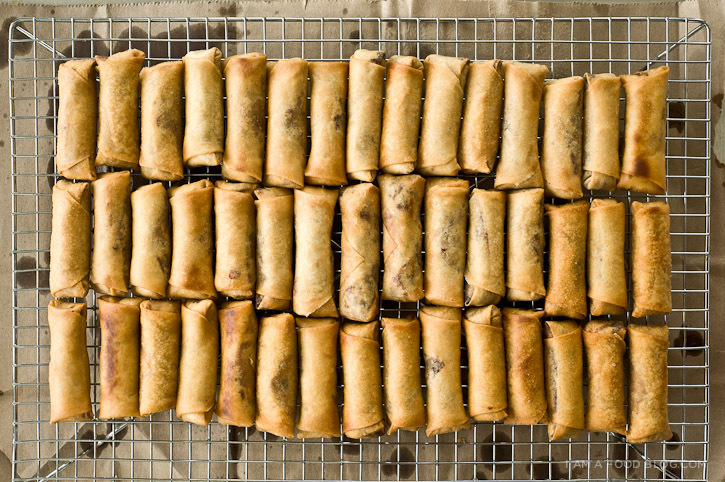 How do you make the spring rolls stay crunchy when taking them to an event? typically i fry them at the event, but if that’s not possible, after frying them, cool them on a wire rack with plenty of space in between so they don’t get steamy/soggy. when they’re cool, you can put them together on a plate/container, but don’t cover it. they won’t be exactly the same as out of the deep-fryer though! Can you eat raw taro root ? 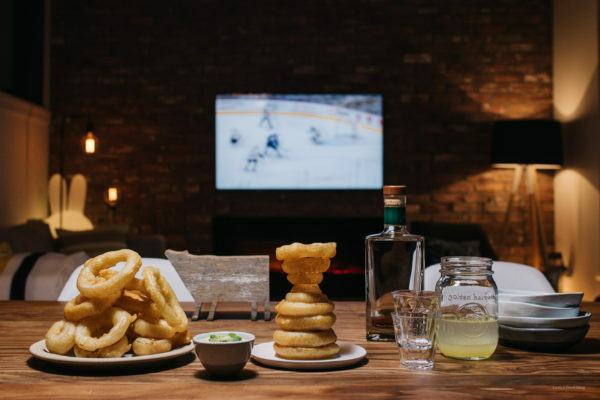 pretty sure you can’t eat it raw – it gets cooked in the deep frying process. I don’t get why there are people out there that post things to confuse other consumers. Spring roll is a rice paper that you use when fried or eaten when the rice paper is dipped in water to be eaten with fresh veggies. Egg rolls are the thicker Chinese/Japanese wrap that is used only for frying. This is considered egg rolls, these are not spring rolls.